Pascale LaPoint: "It just comes through me." 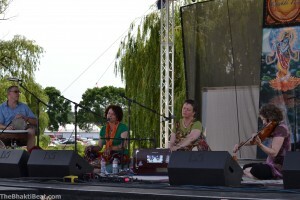 To witness the Bhakti Fest debut of Pascale LaPoint and her band, Kirtan Path, was to witness the unfolding of a bhakti dream coming true. 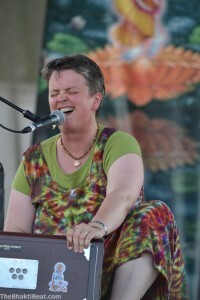 Having just begun leading kirtan a mere three years ago, the Minneapolis-based chantaholic found herself sitting center-stage at the biggest bhakti bonanza the Heartland has ever seen, singing her heart out and basking in the bhav flowing from her own soul-stirring vocals. We were not alone in our surprise at this break-out performance. The German-born LaPoint had the mid-afternoon crowd in the palm of her hand. Chanters gathered tight to the stage, huddling in the little bit of shade that offered refuge from the blistering sun and giving the set an intimate feel, like one big family. Pascale LaPoint and the Minneapolis kirtan crew, after Sunday’s morning set with Sitara, Kalyani and Pavan Kumar, the other Mpls band making its Bhakti Fest debut. The Minneapolis kirtan community — which chanters like Pascale and fellow Bhakti Fest debuters Sitara, Kalyani & Pavan Kumar have built with tireless effort — was in full force, dancing and cheering on one of their own. They twirled and whooped and Hari Bol-ed the crowd right into a standing ovation for the little band from Minnesota. Folks, Krishna Das didn’t get a standing O at Bhakti Fest Midwest. Emcee Shiva Baum raved, calling the band “a definite highlight of day one.” He asked the crowd if they wanted to see Kirtan Path back at Bhakti Fest, and the people roared their approval. You couldn’t help but get a swollen heart from this outpouring of love for a newbie. Shortly after her set, she told us: “I’m not a singer. It just comes through me.” Huh? You’ve never been a singer? She said she attended David Newman’s Kirtan College in 2009 and started leading chants soon after, getting her feet wet at Sacred Rearrangements, a healing center/shop owned by Sitara and Pavan Kumar (aka Susan Shehata & Keith Helke of www.raisingtheconsciousness.com) that had become the “hub of the kirtan scene in Mpls,” according to Sitara. 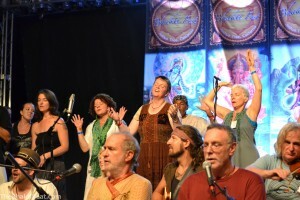 Pascale had traveled to Bhakti Fest in California, and was beyond thrilled when they announced a Midwest Fest. When she “applied” (along with perhaps 1,000 others) for one of the coveted slots on the main stage, she was told the line-up was already set. 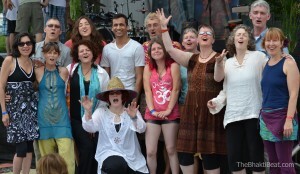 The following day she got an email from Bhakti Fest Founder Sridhar Silberfein inviting her to be part of said line-up. Kirtan Path was already on the radar. Well, their blip on the bhakti radar map just blossomed. Their set was full of classics: KD’s Baba Hanuman, The One I Love ballad Gina Sala and Shantala regularly play, traditionals like Govinda Jaya Jaya and Jaya Mata Kali, and original melodies for Sita Ram, Rama Bolo and a skin-tingling Hare Krishna Maha Mantra that Pascale said is her favorite chant. See if you can feel the energy flowing in the rousing Hari Bol near the end of their set (below). Love & blessings to my dear & beloved friend Pascale. I met Pascale at Kirtan College in 2009 & have built a long lasting friendship ever since. Seeing her photos of her leading kirtan center stage brought tears to my eyes & joy to my soul. I am so happy & proud of her. I know how much she loves Kirtan & we both know how it’s changed our lives forever. I can proudly say that we are Kirtan Addicts 🙂 & proud of it. I wanted to go to Midwest Bhakti fest, but couldn’t afford the plane fare, but my heart & being was there. Kirtan brought me closer to God & all THAT which Is. Thank you! Love & light. Jai Ma! Ohh, what a sweet story and sentiment Keith! I didn’t you know you met Pascale at Kirtan College! With David Newman, right? I keep running into people who have done it — maybe there should be a Kirtan College Alumni Reunion Fest (or is there already?). If there is, someone better tell me about it, ’cause I want to be a fly on the wall! Yes, dreams do come true. You know now that it was that very comment from you on my facebook picture of Pascale at BFMW that inspired me to write her “dream-come-true” story. So Thank YOU! We will look for you at a future Bhakti Fest Rasana! Or at least at your ashram, sharing the voice you’ve found through kirtan. Thanks for your comment!